Boy, Christmas is a wonderful time of year, isn’t it? The presents, the ubiquitous tree, the advertisements, the lights, the advertisements, the overall holiday cheer…, the advertisements. I quickly realized that writing this blog entry regarding Yuletide may date it (monthly anyway), but when retailers begin pushing their “wonderful gift ideas” upon us in late August, ummm, not so much. The image of Santa coming down the chimney sans reindeers (they do not easily fit) is an accepted icon of this time of year, but if there is one thing that is an absolute hallmark of the holiday season, it’s the trash. It takes a lot of paper, a lot of boxes, a lot of food containers, a lot of ribbon, and a lot of sacrificial pine trees to pull this thing off. In a previous blog post I mentioned how many uses there can be for the ever-present cardboard box, but let’s get the round ornament rolling here on some things that the entire family can do to take a little sting out of the mountains of refuse that appear, roughly 7 minutes after the kids have awoken Christmas morning—given that they slept at all. Remember that each moment with your munchkins is a veritable teaching moment, so here are some ideas to get your point across in a fun way. Wrapping paper: Before you haul the majority of it to the recycling center (and I know you will), hand the kids a large trash or leaf bag, and ask them to shred most of it. Your offspring will no doubt enjoy this exercise, and you can use it later as packing material for future gifts. If you’re careful about opening gifts (I know, I know), you can even reuse it to wrap other presents. Fold it up, put it on a shelf, and wait ‘til next year. Remember to laugh all the way to the bank when others are out purchasing wrapping paper next year. Holiday cards: Have the little ones (with proper supervision) cut the fronts from cards, and use them as gift tags next year. They can also be trimmed into smaller squares if the card itself is too large, or punched with a hole punch, then cut with pinking shears for a unique edge. You can also drop the used cards into a plastic container for the kids to play with later to make houses of cards (as done with playing cards). A friend of mine actually lays the entirety of received cards in a rectangular shape on the floor, takes a photo of it, and uses it for the cover of next year’s mailing. And if you’re like me, save the cards and return them to their original senders the following year, with a note inside saying something like “Remember to recycle at Christmas.” They will applaud your thriftiness (or remove your name from their list next year… either way). Turkey: I’ll save this for another blog… LOL! Christmas Trees: Here’s a no brainer. 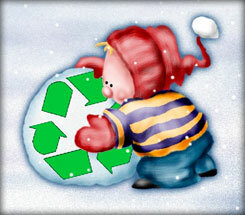 (Every year, 50 million trees are purchased in the United States, and 30 million of those go into the landfill.) If your city or town doesn’t have a tree recycling program (which grinds them into usable and actually quite valuable mulch), consider letting the tree dry out (outside of course), then stripping the needles and small stems to make your own mulch for the garden or flower bed. You can also prop them up in the backyard using stakes and twine (ribbon! ), then hang bird-friendly food (strings of popcorn, pieces of suet, or Aunt Madge’s fruitcake) from the branches. The trees will actually last a considerable time (depending upon the variety), and you will actually be giving something back to nature. In addition, many people in agriculture will chop the trees into smaller pieces and place them in ponds or small rivers to act as fish habitats. However you approach this, be sure to remove any and all ornaments, especially tinsel, which is considered dangerous to wildlife. And by far, the best way to have a “green” holiday season, is to become an advocate for pre-cycling, or the practice of not bringing earth-unfriendly items into your holiday plans in the first place. Consider the pen you write checks with, or the plastic credit card you flash around as the first lines of defense in your personal war on trash. Oh, and my apologies to your Aunt Madge.